For optimal performance, select the model that will support the total weight of your monitors and all items that will be placed on the Winston work surface. This will include your keyboard and mouse. The typical weight of keyboard and mouse is between 2-4 lbs. Please note the monitor and the worksurface move in tandem and not independent of each other. Looking for a single or dual monitor workstation? 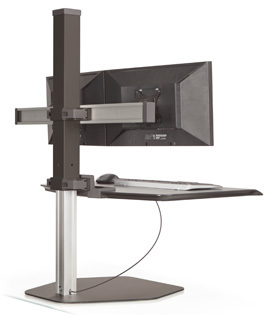 The Winston 4 monitor stand can mount up to four 24" monitors weighing 24-40 lbs. Mount onto a glass desktop without drilling, and move this adjustable workstation up or down 17" by simply pulling on the side of the workstation with your hands. Easily alternate between a sitting and standing positions to ease body pain and boost your health. Standing for just three hours a day can offer the same health benefits as running 10 marathons a year, and even extend your life by 2 years. Standing desks like this Winston workstation often counter several health concerns caused by too much sitting including obesity, type 2 diabetes, cardiovascular disease, and cancer. This quad monitor stand is the first of its kind to have a locking cylinder that keeps your workspace in place to eliminate wobbling while you work. A spacious work surface means you'll have plenty of space for 24-30 lbs or documents, electronic devices, monitors, and other necessary items for your adjustable monitor stand. With a sleek professional design, this multi monitor stand is perfect for a wide variety of users including IT and security desk managers, medical office associates, gamers, programmers, and graphic designers. Convert your desk to a healthy sit-stand workstation in minutes. 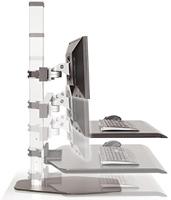 Winston Workstation quad freestanding sit-stand supports a four monitor setup and features push-button height adjustment. The only quad monitor mount in the industry. Freestanding base retrofits to any desk. Compact work surface, push-button height adjust, locking cylinder provides stability. Winston Workstation - Energizing your body. Inspiring your mind. Instantly converts any desk into a sit-stand workspace boosting health and productivity. Recent studies have shown that sitting throughout the day can have the same negative health consequences as smoking. Winston seamlessly integrates into your workday for a boost in health and wellness. Winston Workstation now comes with a compact work surface, ideal for users with smaller spaces who want to take advantage of a healthy sit stand workstation. Expansive work space. Large surface and convenient storage tray allow you to bring all necessities with you when you stand. Upgrade your space. Retrofit your existing desk into a healthy workspace with the freestanding base. Seamless height adjustment. Features a 17" range of vertical height adjustment and a locking cylinder to keep the workstation in place. No manual adjustment needed. 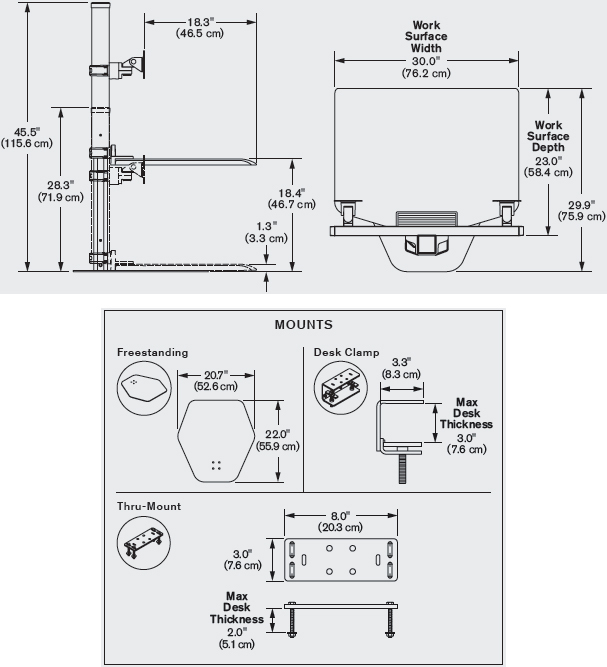 Additional mounting options: clamp mount and thru mount also available. This is a special order item with an average lead time of 4 weeks.